In a landmark report released in May 1988, the Surgeon General of the United States concluded that the nicotine in cigarette smoke was an addictive drug. The report described cigarette smoking as a highly controlled, compulsive behaviour driven by strong, often irresistible urges that could overcome repeated attempts to quit (U.S. Department of Health and Human Services 1988). In an article published just three months later (Becker and Murphy 1988), the late Nobel prize-winning economist Gary Becker posed a provocative question: Could a cigarette smoker still make rational decisions within the confines of his addiction? Becker conceived of a “rationally addicted” smoker as a forward-looking individual who realised he was likely to be consuming cigarettes for some time to come. Such a decision maker would cut back on his smoking today even if he thought cigarette prices wouldn’t rise until next month or next year. Despite its elegance, convincing proof of Becker’s model of the rationally addicted smoker has continued to elude economists. In a research paper (Harris et al. 2018), we looked at the question of rational addiction from an entirely different perspective. We asked 97 regular cigarette smokers to make a series of choices between cigarette packages with varying warnings and background colours, displayed two at a time on a computer screen. With each successive choice, a smoker had to decide which of the two packages contained the cigarettes less risky for his health. We tested whether the participating smokers, confronted with warnings that were repugnant and threatening to many of them, could still make choices consistent with the standard rules of rational choice that are widely accepted by economists. We supplemented our observations on smokers’ choices with data on their eye movements, a technique that has attracted increasing interest among economists. We found that the participants in our experiment universally made choices that adhered to the basic axioms of rationality. Screen #1 below is one of the twelve distinct computer screens shown to our study participants, who were recruited from the faculty, staff, and study body of the Universidad de la República in Uruguay. 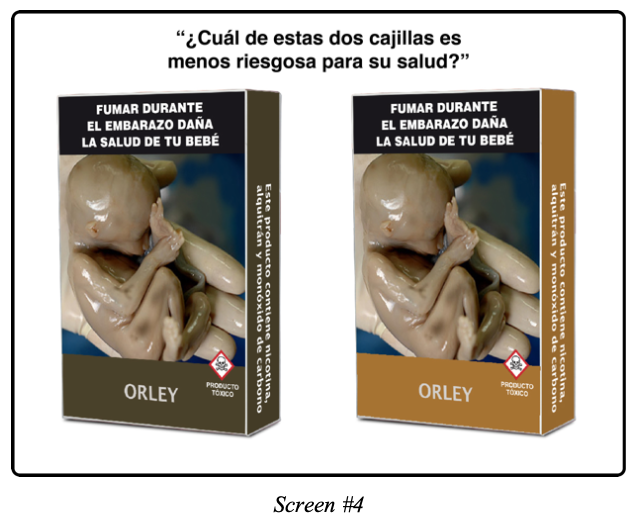 The Spanish text at the top of the screen asks the smoker to identify which of the two packs is less risky for his health. The pack on the left depicts an ulcer of the gums with the accompanying text, “Smoking causes bad breath, tooth loss, and mouth cancer”. The pack on the right depicts a tagged cadaver with the accompanying text, “Smoking cause heart attack”. The packs, designed to conform to the plain packaging standard enforced in several countries, were otherwise identical. 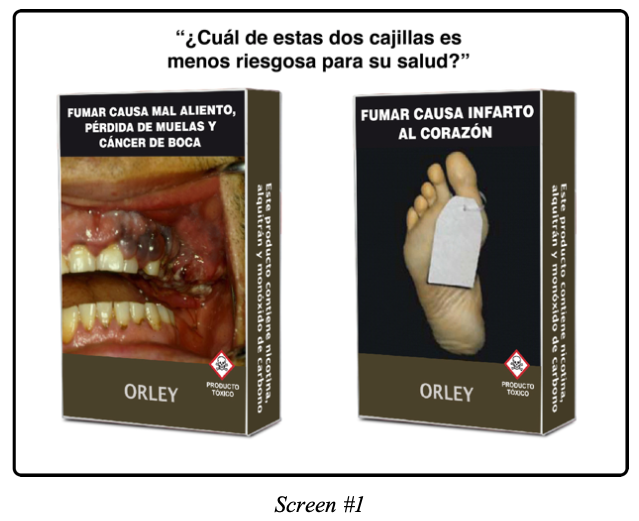 The name Orley at the bottom of each pack did not correspond to any brand currently on the Uruguayan cigarette market. Screen #2 below is another computer screen from our experiment. We randomised the order of the screens, so that some participants saw Screen #2 before Screen #1 while others saw it after. This time, the cadaver on the left is juxtaposed against an image of a boot stamping on cigarettes with the accompanying text, “Take the first step today. It’s possible to quit smoking”. While both packs were otherwise identical, they had a different background colour from the pair shown Screen #1. Now consider a smoker who chose the cadaver as less risky than the mouth ulcer when confronted with Screen #1, and the boot as less risky than the cadaver when confronted with Screen #2. According to the ‘transitivity’ axiom of rational choice, such a smoker should choose the boot as less risky when confronted with a comparison between the mouth ulcer and the boot. That would preserve the consistent three-way ordering that the boot warning was less risky than the cadaver warning, which was in turn less risky than the mouth ulcer. In fact, every one of the 97 participants made choices that were consistent with the transitivity rule. Not all computer screens contained the same background colour on both sides. In Screen #3 below, the package at the left contains an image of foetus in a gloved hand with the caption, “Smoking during pregnancy harms the health of your baby”. The package at the right shows the cadaver. Here, the package on the left has a light brown background while the package at the right has a grey background. When a decision maker is confronted with products that differ along two dimensions – in this case, the package warning and the background colour – economists generally expect to observe ‘compensatory’ choice behaviour; that is, the smoker would weigh the relative riskiness of the warnings against the relative riskiness of the colours. Think about a consumer choosing between a fuel-efficient car with little passenger room and an inefficient car with lots of passenger room. Such a consumer would ordinarily decide whether the increased fuel efficiency compensates for the reduced legroom. In our experiment, however, we did not observe such compensatory choice behaviour. When we confronted participants with yet another screen comparing the foetus warning with the boot warning, we found that 91 out of 97 smokers still maintained a consistent ranking among the foetus, the cadaver and the boot warnings without regard to any differences in background colours. What we observed instead was a form of non-compensatory choice behaviour that economists call ‘lexicographic’. Our smokers ranked cigarette packs first on the basis of their warning, and relied upon the background colour only when the two packs on the computer screen had the same warning. In fact, when we asked participants at the end of the experiment how they made their choices, many told us directly that they used the background colour only to break ties. It is arguable that the smokers in our experiment simply didn’t care about the background colour of the cigarette pack. Such a contention would fly in the face of a substantial literature that confirms smokers do perceive lighter coloured packages as less risky (Bansal-Travers et al. 2011). But we had additional evidence that most smokers in fact used a lexicographic decision rule. 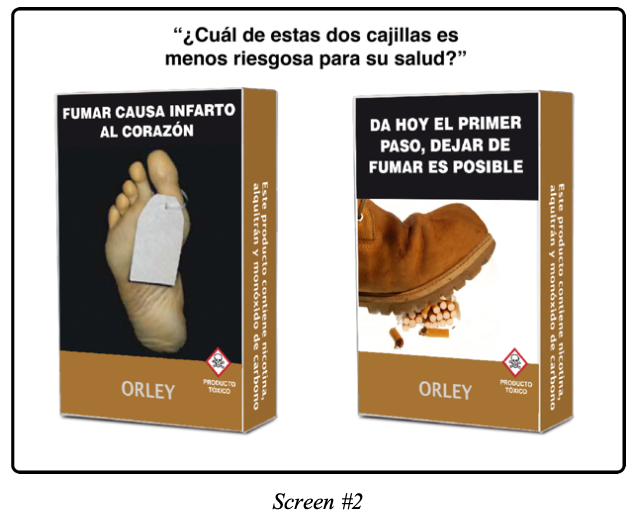 When participants were confronted with Screen #4, shown below, in which both packs contained the same warning but different background colours, they took significantly more time to decide which pack was less risky. Monitoring smokers’ eye movements while they made their choices, we found that most smokers initially fixed their gaze on the warnings in each pack. When they had to choose between two packs with the same warnings, as in the case of Screen #4, they then scanned throughout the visual field. By confirming the lexicographic preferences revealed by their choice, their eye movements thus offered a window into the underlying neural sequences in the brain. How could these smokers make consistent choices among cigarette packs when confronted with images that they themselves described to us as disgusting? How did they engage in such apparently rational behaviour in the face of their addiction? The model of the two-self economic man, originally suggested by the late Nobel-prize winner Thomas Schelling (Schelling 1978), and subsequently elaborated by another Nobelist Richard Thaler (Thaler and Schefrin 1981), offers one explanation for the apparent paradox. “[E]veryone behaves like two people, one who wants clean lungs and long life and another who adores tobacco,” Schelling wrote. “The two are in continual contest for control.” The first of the two competing personas makes repeated attempts to quit smoking. He acknowledges that his behaviour is dangerous. In our sample, 94% of participants agreed that smoking causes lung cancer. The second persona, by contrast, engages in a compulsive, ritualized behaviour often driven by strong cravings for a cigarette. In our sample, 60% had a cigarette within one hour of arising in the morning. As part of the continual contest for control, the first persona employs a variety of strategies to dominate the second one. As Thaler noted, “many smokers pay more for their cigarettes by buying them by the pack instead of the carton – it helps enforce a self-imposed ration such as one pack a day.” The second persona in turn employs an array of self-protective strategies to suppress the first one. Many of our smokers engaged in self-exempting denial, telling us that the adverse health effects depicted in the warnings won’t happen to them. Other participants described a masking strategy, in which they covered the packs or simply looked the other way. The first persona in the two-self model recognizes that all of the packages shown in our experiment do not necessarily contain different types of cigarettes and thus may entail the same health risks. The second persona, by contrast, is prepared to accept the notion that cigarettes have different risks in the hope that his cigarette will be less risky. Our research leaves many questions unanswered. We need to further study our eye-tracking data to determine whether smokers focus more on the images or the text. We found that eye movements and the time required to make a choice declined during the course of the experiment. We need to study whether this represents learning or simply fatigue. Finally, our data do not tell us whether a smoker chooses a pack because he looks at it, or whether a smoker looks at a pack because he prefers it. Distinguishing between these two causal pathways is crucial to elucidating the mind-eye link (Reichle and Reingold 2013). Bansal-Travers, M, D Hammond, P Smith, and K M Cummings (2011), "The impact of cigarette pack design, descriptors, and warning labels on risk perception in the U.S." American Journal of Preventive Medicine 40 (6):674-82. Becker, G S and K M Murphy (1988), "A theory of rational addiction." Journal of Political Economy 96(4): 675-700. Harris, J E, M Gerstenblüth and P Triunfo (2018), “Smokers’ Rational Lexicographic Preferences for Cigarette Package Warnings: A Discrete Choice Experiment With Eye Tracking.” NBER Working Paper 24974. Reichle, E D and E M Reingold (2013), "Neurophysiological constraints on the eye-mind link." Frontiers in Human Neuroscience 7: 361. Schelling, T C (1978), "Egonomics, or the art of self-management." American Economic Review Papers and Proceedings 68(2): 290-294. Thaler, R H and H M Schefrin (1981), "An economic theory of self-control." Journal of Political Economy 89(21): 392-406. U.S. Department of Health and Human Services (1988), The Health Consequences of Smoking - Nicotine Addiction: A Report of the Surgeon General. Rockville MD: Centers for Disease Control, Office on Smoking and Health.